The Nigersaurus was the lawnmower of the Cretaceous Period..
Alternatively called a 'vacuum cleaner' and a 'lawnmower' this Nigersaurus by Safari Ltd, is a beautiful replica of the real thing. 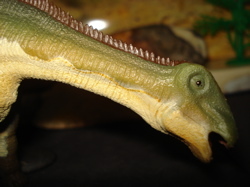 The original was a very unique and strange looking early Cretaceous Sauropod that lived in what were then the swamps of North Africa. With its broad face it looked much like a modern-day lawnmower. With its numerous teeth all lined up around the front of its mouth it in fact acted just like a lawnmower, sweeping a swath of low standing flora (ferns?!). Its (500-600) teeth acting like lawnmower blades, slicing them off and then simply swallowing down, like a vacuum cleaner. A precursor of future technology or just a quirk of nature? You decide. 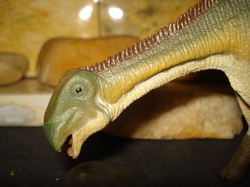 The bones of the skull and neck were extremely thin which required the Nigersaurus to carry its head low down to the ground. (I don't know why, just did.) This was just as well as that was where its food was at. 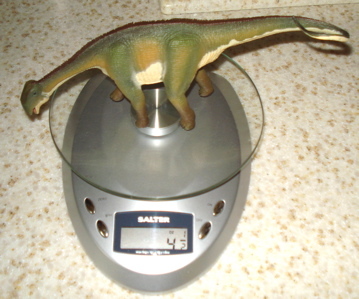 It also had a much shorter neck than your average Sauropod. Overall it was only about thirty (30) feet (9-meters) long and weighed about four tons, give or take. Look it up. 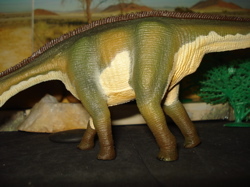 Released in 2008, weighing four & one half ounces (129 gms) and measuring one foot (12", 30.5 cms) in length the Safari Ltd Nigersaurus is a 1/30 scale model. 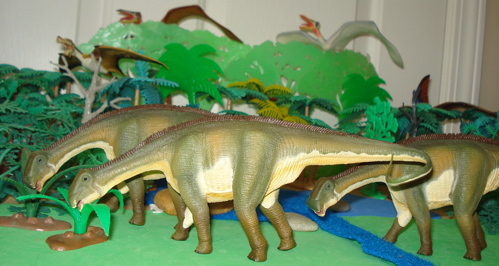 Being out of scale with the Carnegie Amargasaurus and Saltasaurus is inconsequential to their fraternal relationship. Just hanging around on the 20-million year search for the next great fern. 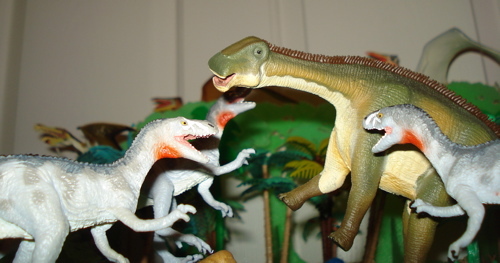 The Nigersaurus would have been the prey not only of local Theropods but also the great "Super Crocs" of the Cretaceous Period. 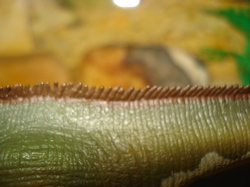 The head of the Safari Ltd Nigersaurus is extremely well done as can be seen above and in the last view a fern would ever have, to the left. The rows of tiny little teeth are clearly seen, as is the tongue and palate. This is typical of the Safari Ltd production since ~2006. Fabulous realism and superb detail are hallmarks of their recent efforts. 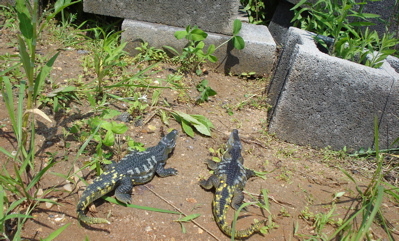 The very nicely done head and neck, with the neural spines that begin just behind the head and run midway down the tail are clearly shown in the pictures below. And below we follow the detail across the back, over the hips and onto the tail. 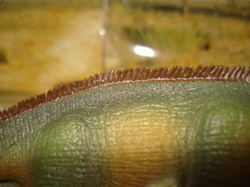 The texture of this figure's hide can be seen easily in these pix. 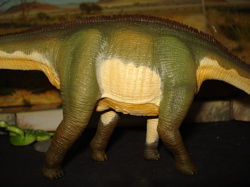 The Safari Ltd Nigersaurus is very well detailed as can be seen in these pictures. (below) The multifarious folds of skin and the ribcage (has our boy been eating enough lately?) are readily visible. The legs of the Nigersaurus are fairly long and really get across the sense of a great, plodding creature, largely focused on nothing more than the next patch of ferns in its path. Everything about this figure is focused forward- towards the mouth and the treasures it is seeking. As noted, giant Crocodiles, like Deinosuchus (terrible crocodile, as if there were really 'nice' ones) would lie in wait, submerged along the edges of ponds, in ambush for unwary Nigersaurus. 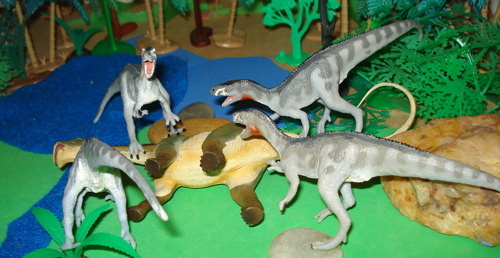 Uh oh, the small herd of Nigersaurs is being ambushed by a Deinosuchus. In this case neither the 'herd' nor individual weapons (such as its tail) are of much salvation. Suddenly emerging from its underwater ambush the Deinosuchus surprises Bob, the unwary Nigersaurus. 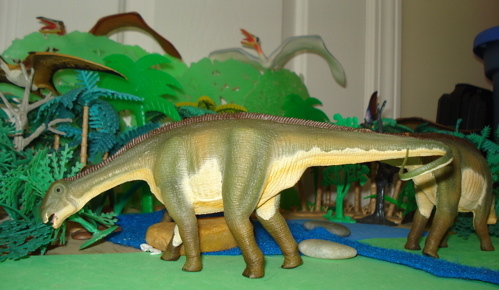 The Nigersaurus, despite having a comparatively shorter neck than other Sauropods, had the standard Sauropod tail that could be used in defense. While certainly useful against the average upright predator it wasn't of much value against the largely horizontal tube of teeth, Deinosuchus. 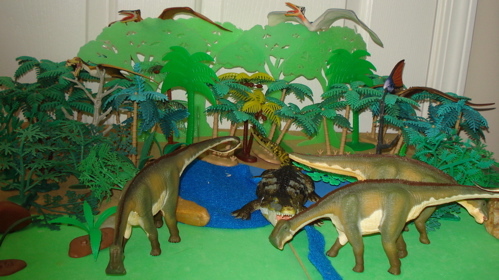 The Nigersaurus Motto, Pt-1: First the Deinosuchus came for Bob. I am not Bob, so I didn't raise my tail. 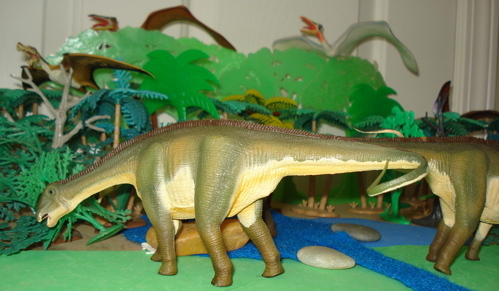 All in all the Safari Ltd Nigersaurus is an excellent replica of a rather odd Dinosaur. Like so many of the Dinosaurs, despite its rather odd appearance, limited diet and lowered level of situational awareness (we presume it kept its head down low most of the time) the Nigersaurus survived in basically the same form, this one, for nearly twenty-million years. An incredibly successful adaptation by any stretch of the imagination. 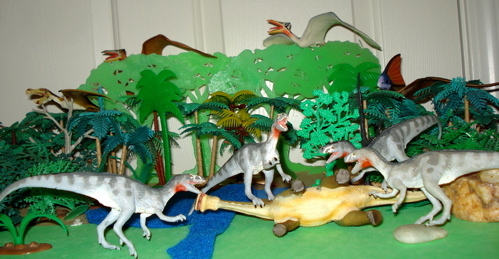 One thing that the Nigersaurus had no real ability to deal with were roving packs of hungry predators. Were there roving packs of predators? Why not? 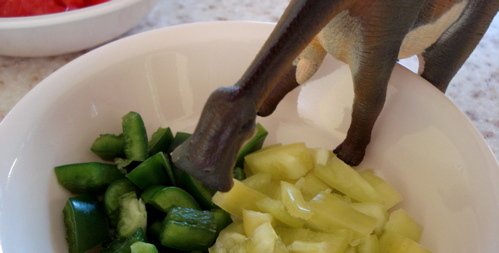 Here we have allowed a pack of Carnegie Deltadromeus to find their way into the Nigersaur diner. There may have been some overlap between the two. There may not. 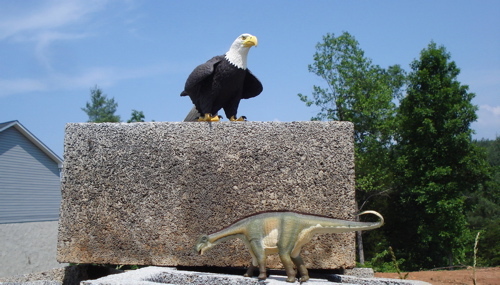 But they are both here today, 100 million years later. Let's take a peek. With the assault on one of their number the other(s) take flight, such as they may. Served nicely, with a side of water. "Leave me alone ya little creeps!!" "Watch out for the tail Fred!" "Hey, stop struggling. You're gonna be us soon." "I thought he'd never shut up." 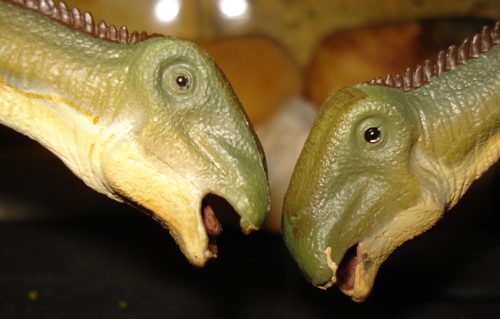 "No, you shut up, Pete"
Dining wasn't a peaceful pursuit when Dinosaurs were in flower. 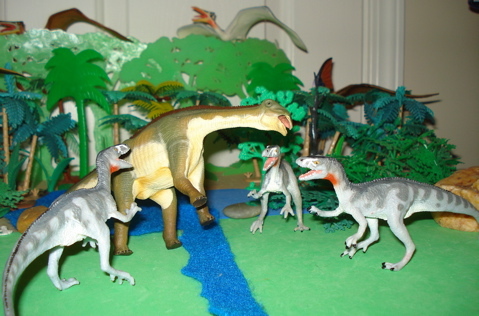 Nigersaurus Motto, pt-2: Then the Deltadromeus came for Todd. I am not Todd, so I didn't raise my tail. 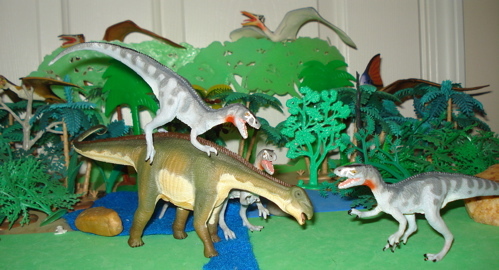 Nigersaurus Motto, end result:When the predators came for me, Bob and Todd were already gone, and there was nobody to help me.... It's a sorry tale. Looking at the Safari Ltd Nigersaurus from a Pteranodon's perspective we see a very nicely sculpted, somewhat 'hippy' looking figure. Sculpted to the best paleontological reconstruction we can see how this Sauropod could get a whole lot of heft into swinging that tail! Lots of muscle in those hips. Looking up (above) and taking the Cretaceous Cockroach view of things, we see the really marvelous underside of this figure. Handpainted to perfection by out-of-work and retrained Chinese coolies the complementary colors and contrasting dark & light provide a very aesthetically pleasing and all together 'natural' appearance. The imprint is clearly seen but in no way obtrusive. 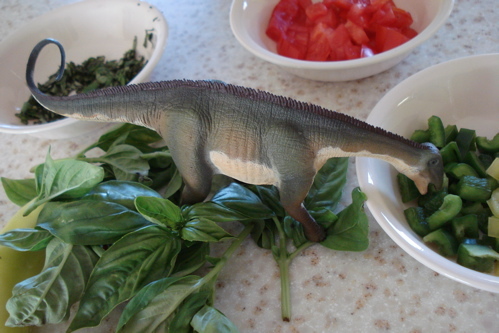 When all is said and done regarding this Safari Nigersaurus we are left with one of the finest little Dinosaur toys replicas anyone will come across. It is typical of the newer (post 2005) Dinosaur toys from Safari Ltd, (opens new window) combining a beautiful paleontologically correct sculpture with very 'natural' coloring. I call these the 'second generation' of Safari Ltd Dinosaur toys and it includes the 2006 Dunkleosteus, Pterosaur & Tyrannosaurus; 2007 Allosaurus, Stegosaurus, Triceratops & Velociraptor; the 2008 Brachiosaurus, Dilophosaurus, Postosuchus, Scutosaurus & Tapejara and the 2010 Apatosaurus, Coelacanth, Kentrosaurus and Liopleurodon. Whew! These are all superbly done and are part of the Safari Ltd brand, to be differentiated from the Carnegie Collection, (opens new window) also made by Safari Ltd. Their only flaw, if it is one, is that they are not all done to scale like the Carnegie Dinosaurs are. In this case, big woof. 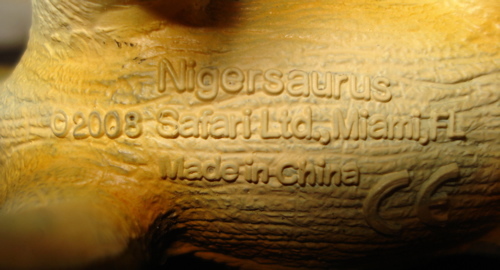 Being quite new the Nigersaurus is in current production and should remain so for many years. At least until some new production process and/or material comes into general use. I have found these online from the Safari Ltd store (opens new window) and other venues ranging from $8.99 to $10.99, plus shipping. And they are on eBay. Of course you can find them in your local toystore as well. This is a certain must-have for any serious collector. For the unserious collector or child's toy box it will make a wonderful and funny-faced addition. Safari Ltd prides itself not only on the accuracy of its models but on the safety of its product. These are certified lead and pthalate (whatever that is) free. Therefore these can serve as snacks. I do not advise this however. Made of a hard rubber they are rugged and made to last through years, or generations, of continued play. Hand painted there is no way of knowing how the 'paint job' will stand up, these being out for less than two years really doesn't give much of a base. I have put it through my 'fingernail test', where I scrape it with my nail for a while, and it has shown no wear from my bio-scrapers. (It does do yeoman's work as a nail-file though). Overall this is a very 'high scoring' model and it really has no flaws. I heartily recommend it! Safari Nigersaurus Motto: Please come for me! I'm well worth my price. 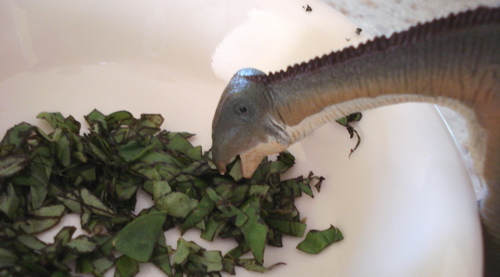 You have been reading about the Safari Nigersaurus and hope that you have enjoyed doing so. 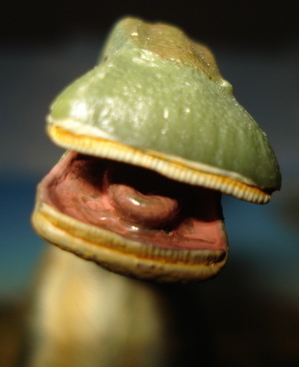 CLICK HERE to return to our Sauropods main page to learn about others of a Sauropodian nature. We are up for the third chapter in our ongoing story of real estate in Dino-town. 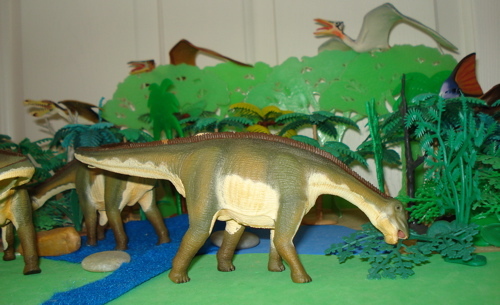 Our Carnegie Collection Amargasaurus and Saltasaurus are now ensconced in their new homes of plastic, straw and sticks. 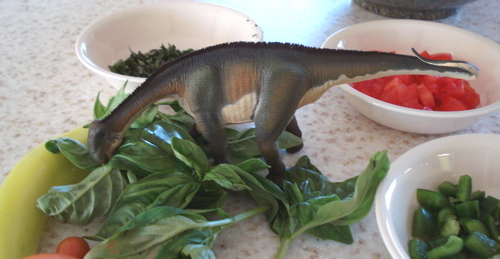 We join the Nigersaurus as it seeks a home it can rely on. ...and the neighbors are quiet and the schools are charter." "And the dining room has fresh food- I'll take it!" One of Nigersaurus' main predators were the great "Super-Crocodiles" that lived in the swamps of (what is now) North Africa. They would lie in wait and sometimes just drop by, unexpectedly. Here a pair have come visiting and find the block-house a bit daunting. "You know Ralphie, this could cause us some trouble...."
You'll want to build your website in the strongest fashion possible. COMPARE and contrast... check out Solo Build It for the finest webhosting services in the business.